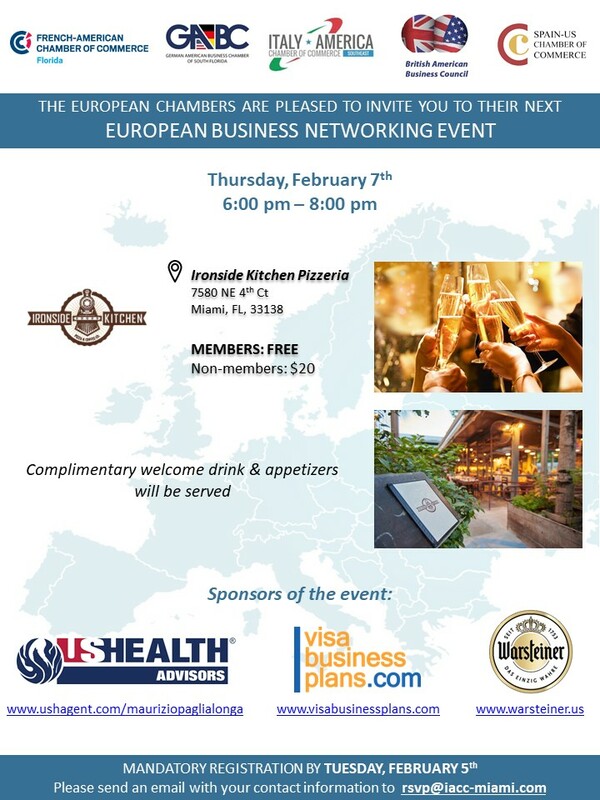 The IACC happily welcomes all its members and friends to attend the FIRST EUROPEAN BUSINESS NETWORKING EVENT of the year that will take place on Thursday, February 7th at Ironside Kitchen Pizza & Coffee Co. Enjoy this amazing opportunity to connect with potential business partners and friends from across South Florida and more! Thanks to USHEALTH ADVISORS, VISA BUSINESS PLANS and WARSTEINER for sponsoring this event. LAST DAY TO REGISTER IS TOMORROW! Please, RSVP to rsvp@iacc-miami.com .